Money and suspected drugs were located on Saturday be Meigs County Sheriff’s Deputies. MIDDLEPORT — Two men from Dayton and a woman from Gallipolis were arrested on Saturday for allegedly selling drugs from a vehicle parked on Storys Run Road. Meigs County Sheriff Keith Wood reports that on Saturday, July 14th, 2018 his office received information that two black males and a white female were parked in a vehicle behind a residence located on Storys Run Road in Middleport and were allegedly selling large amounts of narcotics out of the vehicle. Deputy Campbell, Deputy King, Deputy Leggett, and Sgt. Stewart responded to the area and attempted to make contact with the alleged suspects. Deputies approached the residence and located the vehicle that matched the description and was occupied by two black males and a white female. As deputies made contact with the suspects, a short pursuit took place before the three individuals were taken into custody. Deputies reportedly located two large plastic baggies that contained approximately 80 grams of suspected methamphetamine, heroin, crack cocaine, and marijuana. Taken into custody was Michael Lee Cook, aka “Blue”, 49, of Dayton, Ohio, along with Derrick Lee Cook, 40, of Dayton, Ohio, and Nancy J. Johnson, 37, of Gallipolis. The suspects were all charged with Possession of Methamphetamine, Possession of Heroin, and Possession of Crack Cocaine, all felonies of the second and third degree. The case has been turned over to the Gallia-Meigs Major Crimes Task Force, which will consult with Meigs County Prosecuting Attorney James K. Stanley about the case. Further charges are pending at this time. The Major Crimes Task Force of Gallia-Meigs is a state task force under the jurisdiction of the Ohio Organized Crime Investigations Commission which is part of the Ohio Attorney General Office. The task force was formed in September 2013 and consists of the Meigs and Gallia County Sheriff Offices, Ohio Bureau of Criminal Investigation, the Middleport Police Department, the Gallipolis City Police Department and both the Meigs and Gallia County Prosecutor’s Offices. 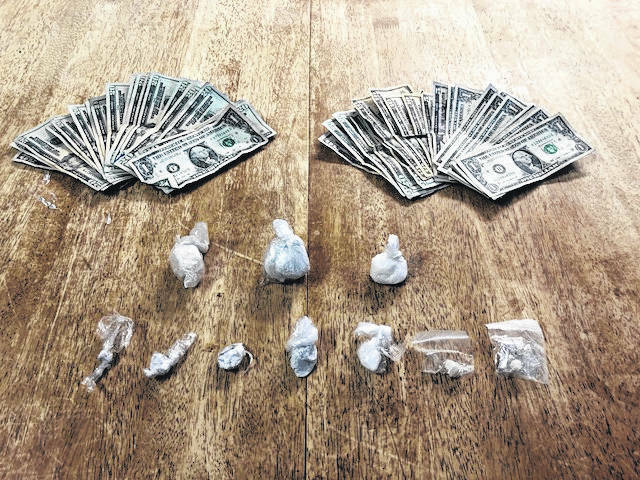 https://www.mydailytribune.com/wp-content/uploads/sites/42/2018/07/web1_Story-s-Run-case_ne201871518929201.jpgMoney and suspected drugs were located on Saturday be Meigs County Sheriff’s Deputies.